Mesenteric efferent lymph was collected from anaesthetized sheep. Lymph flow rate and leucocyte content (> 95% lymphocytes) were measured under control conditions and during stimulation of the left greater splanchnic nerve. 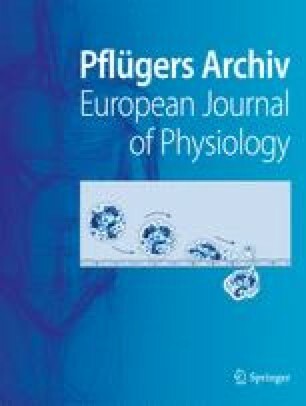 During the first 5 min of nerve stimulation at 4 Hz lymph flow was increased by 128±57% and lymph white cell count by 44±15% (P<0.05, n= 8 in both cases). This produced an overall increase in the white cell output of 228±151% (P<0.05, n=8). The response was repeatable but short lived, with no significant differences from control being observed after the first 5 min of stimulation. There was a rise in the red cell count in arterial blood during nerve stimulation (from 3.21±0.24 · 1012 l−1 to 4.48±0.22 · 1012 l−1, P<0.05, n=9) but no statistically significant changes in the white cell count or percentage of lymphocytes. The increase in lymph white cell output could be mimicked by intravenous injection of noradrenaline while phentolamine blocked the nerve-induced increases in both lymph flow and white cell concentration. The possible mechanisms and immunological consequences of this α-adrenoceptormediated increase in lymphocyte traffic are discussed.